Denielle Backstrom even yelled -shoo shoo- at the bear to scare it away. Coming back home after a short trip and finding an unexpected guest waiting for you can be stressful - more so when that guest just happens to be a grizzly and rather scary bear. 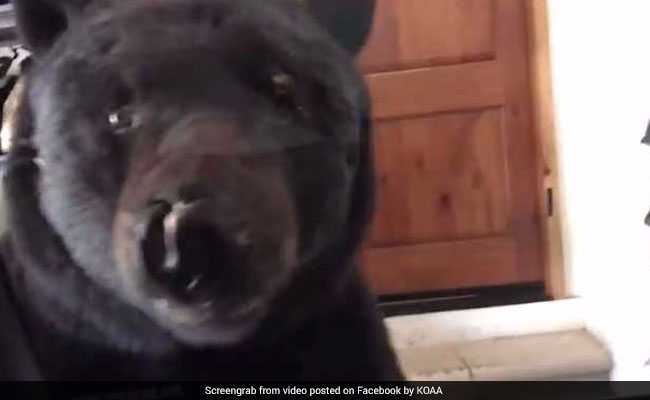 A woman in Colorado Springs, US, got the biggest shock when she returned home to find a huge bear hanging out in her garage. A video posted online shows the bear roaming around the garage while the woman remained trapped inside her car. "Oh my... Freaking bear! Get out of my garage!" she can be heard saying in the clip. "I was like, 'No one is going to believe a bear is this close to me. I'm going to film this,'" Denielle Backstrom told The Gazette. She had just returned after dropping her children at the Cheyenne Mountain Zoo when she found the bear in her house. The video shows the bear first looking inside the car through a window and then trying to find a way to open a refrigerator close by. It is, however, seen moving away after Ms Backstrom honks at it. She even yells "shoo shoo" at the bear. Ms Backstrom eventually reverses her car slowly towards the bear to scare it away. Ms Backstrom later contacted Colorado Parks and Wildlife to look into the matter, reports KOAA.com. The team is already trying to trap the bear since it is believed to have stolen ice cream and M&M's from a garage in the same area earlier.